Luna mask is from Gypsy Renaissance's Celestial Visions mask collection. 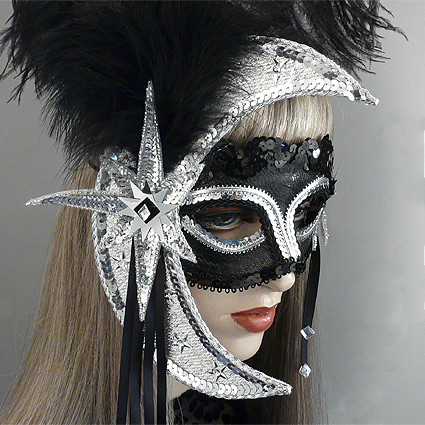 Luna is a handmade black and silver masquerade mask with moon and feather adornments. Luna mask is covered with black lamé and trimmed with black and metallic silver braiding and sequins. Mask is adorned with a silver lamé crescent moon and sequin star and topped with black ostrich and marabou feathers, studded with rhinestones and silver metallic stars. Cascading black satin ribbon dangles on both sides.